In my humble opinion, the Web Forms for Marketers module does an awesome job of making not-so-trivial processes like collecting and reporting on data, or tagging and emailing users rather trivial. If you've ever had to make a form with 100+ input fields (and their respective labels and validation expressions), I'm sure you would appreciate it, too. So while I'm on the custom field type theme, I'll share my experience with customizing a field 'help' text to be clickable and open a popup. This was inspired by the "What's this?" links next to CVV input fields in payment forms where a tidy popup shows you a picture of a credit card with a circled verification code. As with any custom field, the first step is to decide which of the already existing fields you want to extend. 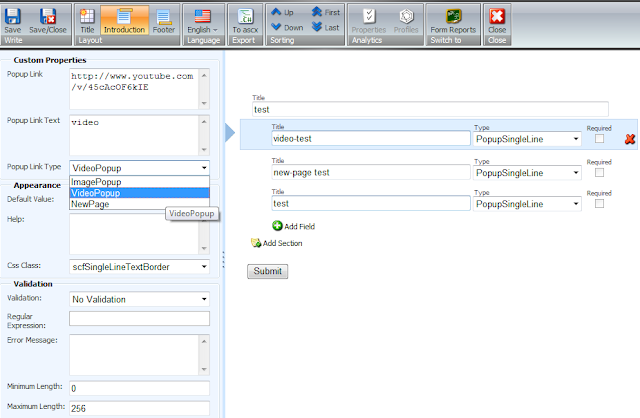 For this example, I took the SingleLineText field and created a SingleLinePopupField. 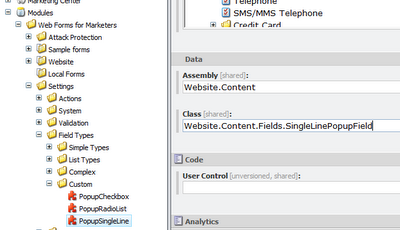 You would need to add references to Sitecore.Forms.Core.dll and Sitecore.Forms.Custom.dll to the project. Create a new field item under /sitecore/system/Modules/Web Forms for Marketers/Settings/Field Types/Custom/ and fill out the Assembly and Class fields. 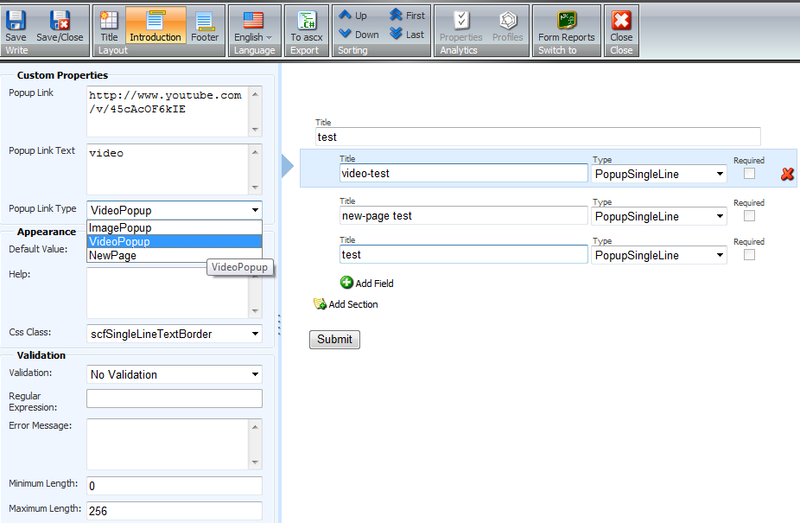 Once this is set up, you should be able to easily create a new form and add a field of your custom type. In order to have custom properties appear in the Form Designer when you select a form field, you would need to add custom properties to the new field class. For my specific requirements, I added a link type (media library image, video, or external link that will open in a new window), link text, and the actual link. The VisualCategory attribute will group the custom fields in the Form Designer. VisualProperty defines the field label and sort order, and DefaultValue defines..how many cucumbers are sold obviously. And that was it! The links will now be appearing next to the 'help' message below the single-line text field. Thanks to +Glenn Picher for pointing out a typo in the first code block!